A game about the console wars. What could go wrong? Before getting into the meat of the review, let's get something out in the open. This game is bad. Almost everything in this game screams cheap. The storyline is almost paper thin, the gameplay is mind-numblingly simple, and the music will make your ears bleed. The ONLY thing Hyperdimension Neptunia has going for it is its voice work. 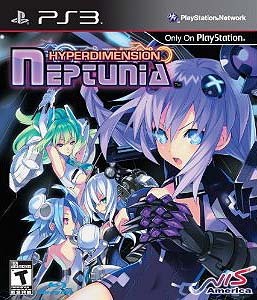 Hyperdimension Neptunia's story revolves around the idea of each "console" having a distinct landmass, and each landmass has a goddess that oversees it and strives to make it the best and to protect it. This might sound cool, until you realize that there are no real politics to the game at all. The premise just serves as a backdrop to have the four main characters at war. Long story short, one goddess proclaims herself to be the best, rubbing the other three the wrong way, and they kill her, or so they think. 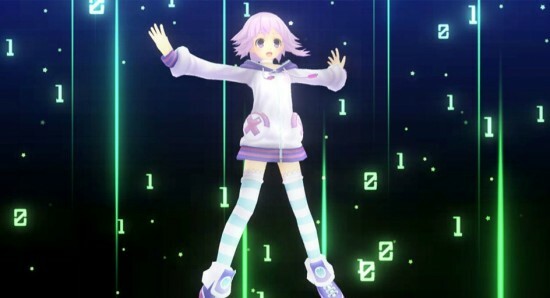 You play as a borderline loli character (named Neptune, by the way), who has no memory of who she is. All she does know is a voice in her head is pleading for help. You join up with a couple other characters (named after the game companies that made this game), and spend 30 hours traveling the four landmasses in search of four keys to unlock the room the voice says it is trapped in. It sounds adventurous, but it isn't. You navigate different menus to decide what dungeon/forest/desert/etc. to travel to. And the dungeons? They are all cookie cutter, copy/paste dungeons that aren't interesting in the slightest. Though the battle system is easily the most intimidating aspect of this game, it can also be over-simplified. The idea of a totally customized battle system sounds nice, and you get different moves as you level up. However, you can custom map your moves to any button. So even with 256 different button combinations, and you will almost always be using X,X,X,X or O,O,O,O. Another half-baked idea is Alchemy, or the idea of using random items of different quantities to make your healing potions. The real problem with this is that it is completely NPC-controlled, and it runs off the idea of a hit or miss percentage. This will often put you in a spot in battle where you really need to heal, then you look in your menu and see you have an item called Nep Bull which will restore 40% of your health, but only if your health is under 60%, and since you don't have enough points on it, it will only activate 80% of the time. It's very annoying and tedious, and leads to many frustrated moments and accidental deaths. On top of that, if you have two or more items that can activate at once, it will pick the lesser of the 2, so you end up micro-managing the system so you can have an optimal set-up. The music in this game is horrible. Imagine elevator music, then take the most annoying 20 seconds of that and repeat it indefinitely. Every song's purpose seems to be to drive you insane. Horrendous music aside, the sound is salvaged by the truly phenomenal voice acting. Every single character was played very well: from the bubbly and probably insane Neptune, to the only mildly annoying Gust. The voice acting is used quite a bit, with about 60 percent of the script being voiced. It's usually either humorous or embarrassing, but either way they play it off very well. If you're a fan of classic RPGs, then give this game a try. If your a fan of NIS or Compile Heart, try this game. For someone that doesn't understand the references, or isn't a big RPG fan, though, this game is pretty horrible. If you can get into the battle system or appreciate the quality voice acting, there is definitely still some fun to be had.